I recently asked my Instagram followers if they would like to know more about how to cook pasta the Italian way. How to marry together a sauce and a pasta shape. However before I get started I think if we're going to talk about how to cook pasta, first we should discuss quality. Not all pasta is created equal! I know you will be thinking that I mean fresh is better than dried. But in Italy many people eat dried pasta every day and make it fresh just for special occasions. The reason is, dried pasta in Italy is of an outstanding quality. However what you do need to find, especially outside of Italy is a good brand. One of my serious comfort food favourites is Garofalo. Garofalo originates from the village of Gragnano near Naples. The brand was created in 1789. With its hilltop winds and fresh water springs Gragnano is famous around the world for having the perfect geographical location for creating pasta. I also love that they have very simple clear packaging. You can see all of the pasta pieces. They pride themselves on having nothing to hide in the packets, no broken bits at the bottom just beautifully shaped pasta. When choosing your pasta brand check that it's made with just durum wheat semolina flour and water. Nothing more! You may have also noticed that some brands talk about bronze dies. This means that the pasta is cut with a bronze stamp. This not only can create many different shapes of pasta but it leaves a rough and porous edge which makes your sauce stick to it. Always use a large saucepan, it's better to be too big than too small. Put cold water into a pan and bring to the boil. Never add boiled water from a kettle. Salt the water once it starts to boil. Two good pinches or a tablespoon. Preferably coarse salt. You won't end up eating this amount of salt as most of it will be poured away with the pasta water. Don't think it will taste the same if you add salt at the table. If you do this salt just sits on the top of the pasta and it will be seasoned unevenly. Once the water is boiling, then add the pasta, not before! Don't add oil ever. I don't know where this trend started in the UK but it's a waste of oil and it makes your pasta slimy and then the sauce doesn't stick to it. You don't need this to stop the pasta shapes sticking to each other just give it the odd stir and this shouldn't happen. Read the cooking time for the pasta and use it. Even Italians do this. Every pasta shape/brand is different and overcooked pasta is the greatest sin of all in Italian cuisine. Taste it for yourself a couple of minutes before it should be done. Take a piece out and cut in half. You should see a small white bit in the centre of the cut. If this is tiny and the pasta is slightly chewy it's cooked. If there's no white at all it's probably on its way to be overcooked! But a little bit of white or a little ghost as they say in Italia is perfect! When it's cooked take the pasta to the sink, put a colander in the sink and put the cold water tap on. Pour out the pasta and shake gently, it's fine to still have some water in the pasta as the starch actually helps to bind your sauce and pasta together. Now take your pasta over to your saucepan containing the sauce and pour the pasta INTO the sauce. Mix them together and then serve. Pasta should be served immediately. Literally people rush to the table in Italy as soon as someone says "La pasta e' pronta!" Because pasta which is left sat for too long goes cold and sticky. You want to get it hot! You may think that pasta is pasta and it all tastes the same. It just comes in different pretty shapes. I know how you feel, I used to be just like this. I would serve my Italian hubby a variety of sauces with whatever shape took my fancy that day. I chopped up vegetables Jamie Oliver style in enormous big chunks, all 'rustic' thinking that I was sooo authentic with my Italian cooking skills. Very kindly Mr Prada never really made his feelings known about this until many years later when by osmosis I had moulded my ways into those I've observed in 12 years of living with Italian culture. Italians don't like big pieces of vegetables in their sauces. Especially the base of the sauce which is often onion, celery, carrot, garlic, these should be barely visible. Then other vegetables can be seen but the idea is that the sauce is so smooth that not one ingredient stands out, you should have a taste which is a blend of the items in it. If you are going to leave some pieces bigger, cut them to a similar shape and size to the pasta shape you are using. The same is true of meat and fish in that you won't be given a plate of pasta with a chicken fillet placed on top! Apart from the fact that Italians don't tend to put chicken in pasta. I know, sorry Chicken Alfredo! The meat or fish is in small pieces cooked down to a similar size to the vegetables. Spaghetti, linguine and other thin long pastas go well with light tomato sauces, egg (Carbonara) or fish with olive oil. As the strands of the pasta are silky and fine these sauces can swirl around them easily and coat them well. Tagliatelle, pappardelle, Mafalde (my absolute favourite group!) are long flat pastas like ribbons. They suit really robust sauces like ragu, game such as wild boar or chopped sausages. They also go well with anything creamy. So Ragu' or the famous bolognese as we call it in the UK should actually be served with tagliatelle. Pasta tubes such as Penne and Rigatoni go well with most sauces but their shape is quite important as it can hold the sauce ingredients inside. Peas for example or small pieces of meat or vegetables mix well with these and the taste is amplified because the pasta becomes filled with the sauce ingredients. Penne can also be smooth 'Lisce' or ridged 'Rigate'. Left: Garofalo Penne Ziti Lisce. Right: Garofalo Penne Mezzani Rigate. Other short pastas such as Farfalle (Butterflies), Radiatore (Little radiators!) Fusilli (Corkscrews) and Orecchiete (Little ears!) go well with most sauces. It's their porous surface and the texture of the pasta, how it folds in your mouth. Along with the ability of the sauce to stick to the pasta makes the taste quite special. Pasta containers! Conchiglie (Little shells), Lumaca (Little snails) and Lumaconi see below, (Big snails) are some of the most comforting pasta shapes to use. They also are a quite striking if you are cooking for guests. These work well with Ragu' or other meat sauces, those with pieces of small vegetable so they can all fall inside the shape and stay inside as you eat them. Lastly we have the teeny tiny shapes that we often feed our children. Stelline (Little stars), Farfalline (Little butterflies). These can be used for children but are also found in wintry stews and soups. Examples of these are Minestrone soup and 'Pasta con fagioli'. A bean and pasta broth. Try and think of pasta as a vessel to pick up all of the sauce where possible and that you are choosing the best shape to help you do this. It may seem crazy to think there is so much to consider but pasta is very similar to wine or tea. Where it's created, how it's treated and taken care of. Essentially the journey from field to table makes a huge difference to taste and then ultimately to your enjoyment of it! So where can you buy a good dried pasta? It's no longer difficult to buy a great quality pasta in the UK. 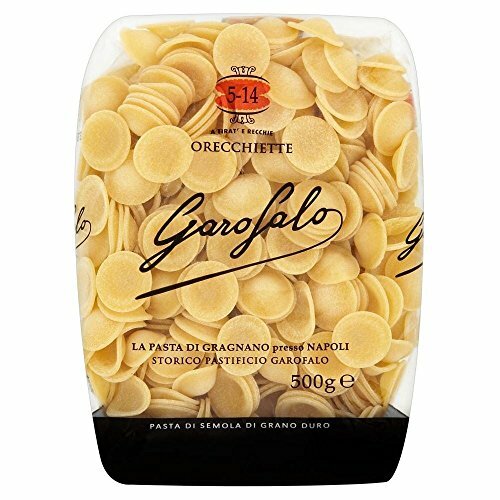 If you would like to try Garofalo for yourself it can be found in Ocado, Waitrose and Amazon which is where I buy mine. Would you like to try matching pasta and a sauce? Which are your favourite pasta shapes?